This book was about the Garcia family and their journey from the Dominican Republic to the United States, and the assimilation there. This is told through swapping perspectives--sometime it is told through third-person limited, through Yolanda's first-person description, or Fifi's first person description, or from the POV of the Garcia's maid back in the Dominican Republic. It is also told out of order, which is fun to read. In brackets and in pieces, I got to figure out how the Garcia's fit in New York, why they left, how they left, and the cultural differences between countries. This story also reminded me a little of The Namesake, in the way that settling in a new country is described. 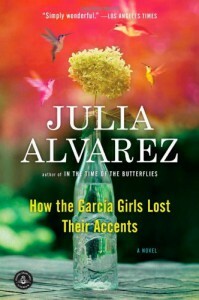 There are prejudices, language barriers--colloquial language, too--and a sense of unease that Alvarez carries throughout the novel. The writing here was beautiful, and even though some of the narration is confusing to follow at first, it was elegant story-telling.